NBC News has begun using the “Today” show to prominently promote another one of its properties by using Studio 1A’s prime corner in New York City. 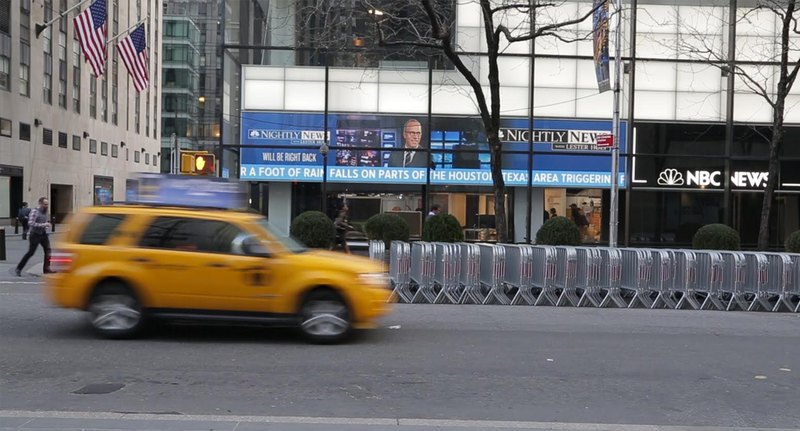 The studio’s large video panels, which band around much of the space between Studio 1A’s first and second floors as well as parts of the walls, will now show a live feed of “NBC Nightly News” every evening starting at 6:30 p.m. local time. The video frames of the broadcast will be accompanied by a news ticker along with custom branded “Nightly News” graphics, as show in this photo taken during a test Monday. The video panels were first added to the outside of Studio 1A in 2012, having been installed while the show was in London covering the Olympics that summer. The walls regularly show up on air displaying various graphics, including the date during the show open, viewer-submitted photos and topical graphics for both indoor and outdoor segments. During the day, other content fills the space, including a news ticker. Previous versions of Studio 1A filled this space with a variety of configurations of monitors, digital clock readouts and a single-color ticker, but the video bands give the show much more flexibility. “Rockefeller Center is one of the most popular destinations in New York. These screens give us a tremendous opportunity to share America’s most-watched evening newscast with New Yorkers and visitors as they experience a true cultural landmark. We’ll look for ways to make it an even bigger part of our broadcast moving forward,” said “Nightly” executive producer Sam Singal in a statement issued by the network. It’s been a busy week for Studio 1A — it played home to the retooled “Sunday Today” for the first time Sunday.